The confusion is exacerbated by the fact that relatively little is understood about Zika, and that although a causal link between the virus and microcephalyis strongly suspected, there is as yet no scientific evidence to confirm it. Regions experiencing a Zika outbreak are looking to collect as much information as possible while attempting to deal with theAedes species of mosquito that is known to transmit the virus, along with other diseases in the flavivirus family such as dengue fever. Brazil, the country most heavily affected by the Zika outbreak, faces additional complications as it continues to make preparations for hosting the 2016 Summer Olympics. Over the past week, some countries have expressed concern over attending the multi-sport event. The head of Kenya’s Olympic Committee suggested that their athletes could pull out of the competition. “We are not going to risk taking Kenyans there if this Zika virus reaches epidemic levels,” said Kipchoge Keino. The US Olympic Committee have also reportedly stated that any athletes or staff who are concerned about the Zika virus should not go to Brazil if they do not feel comfortable. But it is not just people who are scheduled to travel to Brazil who are wary and worried about the mosquito-borne virus; a recent poll conducted by Reuters/Ipsos has shown that a growing number of Americans are being discouraged from traveling to Latin America and the Caribbean. The poll, conducted at the start of the month, found that 41% of people who were aware of the virus were now less likely to take a trip to the region. But are these people right to be so concerned about the virus, a disease that has only recently come to prominence since 2007? In general, many experts suggest that the disease does not represent as much of a threat as some news stories might make out. “For most of the non-pregnant population, there is no reason to think Zika presents a particular risk,” states Centers for Disease Control and Prevention (CDC) Director Dr. Tom Frieden. Medical News Today asked Prof. Richard Kuhn, head of biological sciences at Purdue University in West Lafayette, IN, about whether people should be worried about Zika. 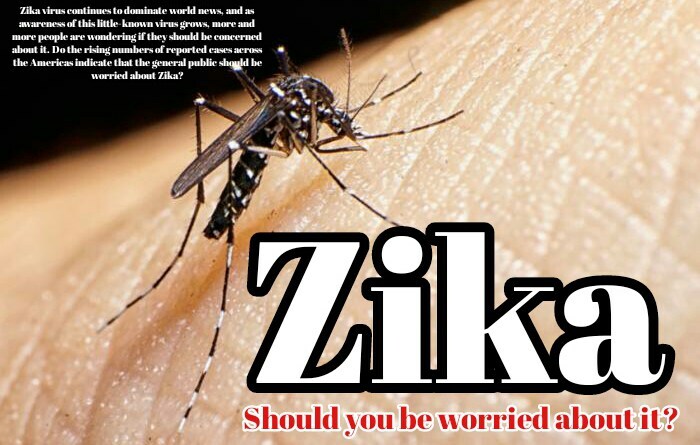 Indeed, it is the link between Zika virus and birth defects that is the main cause for concern, considering that symptoms of the virus itself are typically mild. Most people who become infected are asymptomatic, while those who are not may experience symptoms such as fever, rash and conjunctivitis for up to a week. Recent news from Venezuela, one of the many South American countries reporting cases of the virus, may add to people’s concerns about Zika. President Nicolas Maduro announced that three people had died from complications associated with the Zika virus, although in his address on state television he did not provide any details about the deaths. Rather than attributing these deaths directly to Zika, however, some experts suspect that the deaths could be linked to Guillain-Barre syndrome, a serious autoimmune disorder that affects the central nervous system. Venezuela is currently experiencing shortages in medication to treat this condition – as well as painkillers and insect repellent – and has relied on Brazil, China, Cuba, India and Iran to provide vital medicine. The CDC have previously stated that fatalities from Zika are rare. Added to this is the fact that the Venezuelan health ministry have been relatively non-communicative with regards to the impact Zika is having in the country. In the absence of details, it seems best to focus on what the experts are saying rather than what remains unsaid. In the UK, a public health official has told the government that the growing number of reported cases around the world could be attributed to people looking out for the disease. We have raised awareness so people are more aware of the infection and we are likely to see more cases,” said Dilys Morgan, head of the Department of Gastrointestinal, Emerging and Zoonotic Infections at Public Health England. Morgan explained that a similar increase in cases had been recorded last year with chikungunya, another flavivirus. When an outbreak occurred in the Caribbean, hundreds of cases were subsequently reported in the UK. Although it has only recently come under the spotlight, Zika has been around for many years, having first been discovered in 1947. It was only in 2007, however, that the first outbreak of the virus – in the Pacific – was documented. In any case, all recommendations about Zika virus from major health organizations – including the CDC and World Health Organization (WHO) – focus on what impact the virus could potentially have on pregnant women rather than other populations. CNN asked Dr. Frieden if the general public should be scared of Zika, or whether it was the emotional aspect of the link between the virus, pregnant women and microcephaly that had made people increasingly concerned. The message to be taken away then, is that while people traveling to areas affected by Zika should take precautions to avoid being bitten by mosquitoes, it is women who may be or who are planning to become pregnant who should be considering postponing travel to these regions and following the recommendations of health care professionals. Previously, MNT reported on a review published in International Journal of Infectious Diseases that suggested Zika could potentially spread to mainland Africa and Europe.